The call-to-action (CTA) is one of the most important elements of any promotion. It doesn’t matter if it’s an online or offline promotion, without a call-to-action your audience is left with no direction on what do to next. With offline direct mail marketing, CTA’s aren’t about just ‘clicking here’ and taking action in this way, but they are still about direct actions and direct results. To start, ask yourself, what do you need customers to do first? If you’re in real estate and your end goal is to close that sale, how does that process start? Possibly it’s with a phone call. Your CTA would, therefore, need to be something like ‘Call Us Now’ followed by a phone number. In this example, the CTA could be even more enticing, so read on to find out how to take this further. Remember this key rule for a CTA: a CTA should be big, bold and explicitly clear! Eye-catching creative isn’t enough if it fails to deliver responses via a strong call-to-action. It might stand out amongst other mail and it might well be read, but you must make it clear what the receiver should do next. They won’t take the time, or expend the energy, to discover this on their own, it needs to be explicitly clear. So, step one is to ask what you want customers to do first. What action do you desire from them? The second part is to ask yourself, what benefit am I offering them? Finally, are you driving an incentive to make them take that action? Why should they take that action? The incentive is called the “offer”. 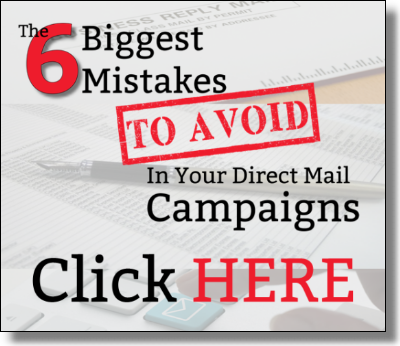 The offer is the second most important piece of direct response (mail, tv, …other) campaign. The CTA is an explicit request to take advantage of the offer. The formula for successful direct response is 70/20/10 – 70% list, 20% offer, 10% creative. We know that when we get the right offer, in front of the right audience, good things happen. Creative helps us break through the clutter (get noticed or interrupt). The offer is what compels people to respond. The offer needs to be compelling enough that no one in their right mind would ever be able to say no – though we still need to make money. We can look at the first promotion as acquisition cost if it leads to regular ongoing orders (lifetime customer value). The offer should be non-threatening or low perceived risk. We also need to reduce/remove any barriers. You see how people say free, no obligation, complete money-back guarantee, free signup, not credit card required…? These are all designed to reduce barriers for responders. You could really make your CTA’s enticing, rather than the standard ‘Call us Now’ or ‘Visit our Website’. Add to this with powerful phrases such as ‘40% off when you call us today’. [This is the offer + CTA] You can add time-sensitive incentives or just give them a direct message such as ‘Call now for an exclusive quote’. If you don’t have the capacity to take calls, or this isn’t your desired action, then you might want to focus on driving website visits. This might seem like a difficult task without ‘click here’ buttons that you would find on a digital promotion. However, you can strategically position your web address with a CTA such as, ‘Visit our website for 20% off new sales!’. The design of the CTA is also incredibly important and should be taken into consideration along with the overall design of the promotion (whether that’s a postcard, flyer or snap pack). Think about the different elements of the design, from the color of the CTA; does it pop against the rest of the design? The position of the CTA; could you place it higher on the design rather than at the end? Finally, think about the size of the CTA. You want it large enough to be seen, but not too dominating that the key message/benefits you’re trying to convey from the promotion get lost. If you’re new to direct mail you could benefit from a FREE direct mail design session with one of our design team members here at Zairmail. We have everything you need to get your campaign off the ground, including targeted direct mail lists and free direct mail sample kits. We have already helped 100’s of customers enhance their direct response programs and supercharge returns. Can you afford not to produce the same results for your business? Click here to schedule a free consultation and start driving greater business growth now!